We had 3 yesterday: TokTek, alias Tom Verbruggen, The HandyDandy and Cathy van Eck’s Hearing Sirens. The Handydandy (Bernhard Bauch, Florian Waldner, Gordan Savicic, Julia Staudach, Luc Gross, Nicolaj Kirisits) made a pretty fun gig by playing music on their mobile phones as if they were rock guitars. The phones, used only as interfaces, are connected via Bluetooth to a computer network, a virtual opposite to the “human network” music-band. TokTek’s performance blew everyone’s mind. 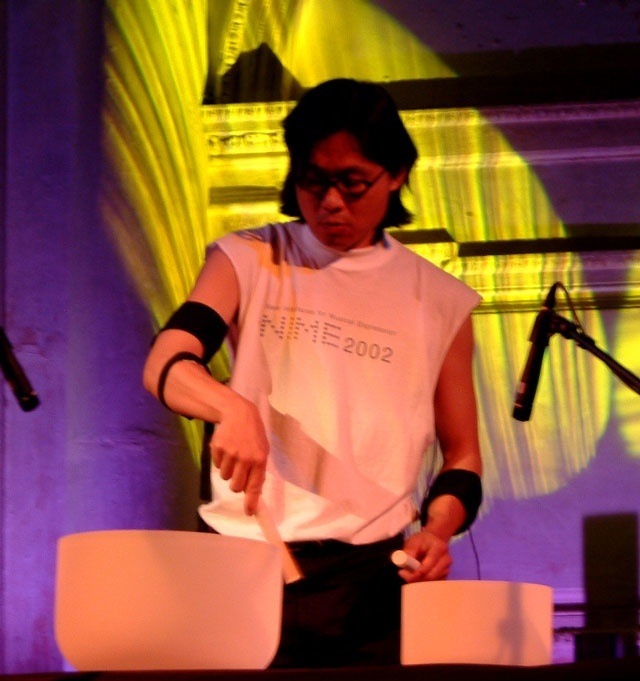 The artist explores new modes of interaction in live performance. He structures the unbridle clicks and cuts of his circuit bend gadgets to a fragile disturbance. Sampling with a joystick Tom creates unlogic dynamic compositions. Started by playing an old vinyl of lessons of french, then went wild with buttons, keyboards and knobs, later grabbed a joystick, then had a go at a guitar, kid’s toys, etc. By looking for information about Tom Verbruggen online i discovered another of his work called Moederkoek, which translated is mother-cake but refers in English to the placebo. Tom performs while his mother bakes a cake in a self-assembled kitchen. Tom samples his mum’s baking and the sounds its produces in real-time to realize an improvised composition. 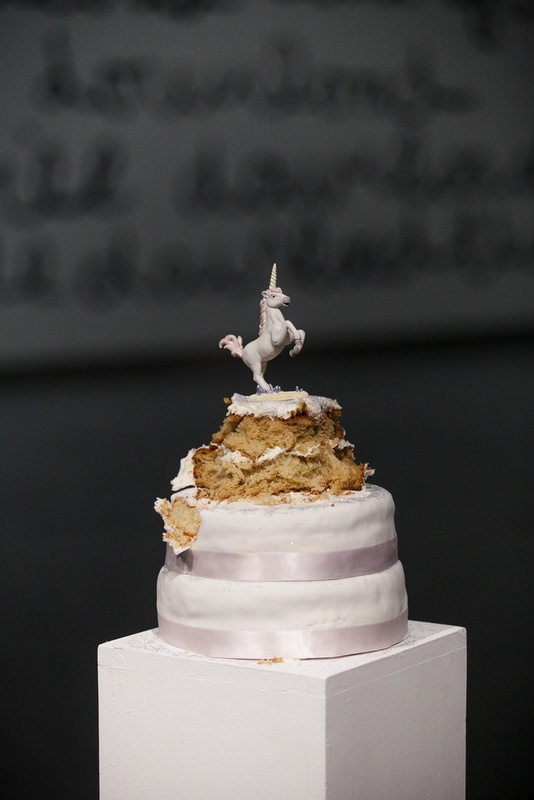 At the end of the performance, the cake is baked and served to the audience. He also creates installations such as the Crack-Canvas. Using STEIM crackle box hardware, the artist has created paintings that produce sound. 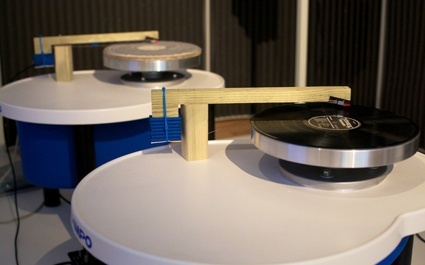 Each painting can produce sound by itself but when connected with other paintings forms a ‘painting orchestra’. By connecting cables between the paintings, the sound changes, while the cables length, colour and form, form a drawing on the wall or in the space the paintings are hanging. 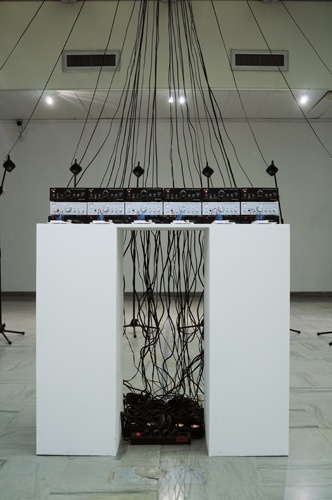 In the live version of the ‘Crackle-Canvas’, Tom invites the public to grab the cables and make their own compositions. 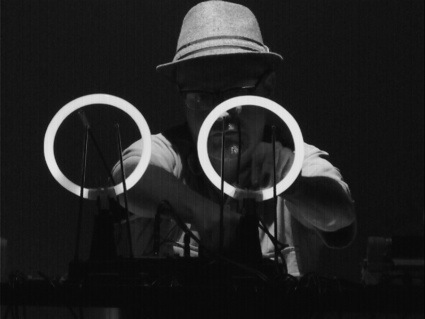 Tom Verbruggen is part of the New Interfaces for Performances programme. Images of The HandyDandy performance and of TokTek‘s. Posted in gadgets, installation, mobilemusic workshop, performance, sound, telephony. Bookmark the permalink.